The journal comprises of articles are relevant to both academics and practitioners, and are the results of anonymous reviews by at least two referees chosen by the editor for their specialist knowledge. The blind peer review and editorial policies are largely contributed by the 'tourism forum' of American Association of International Researchers. 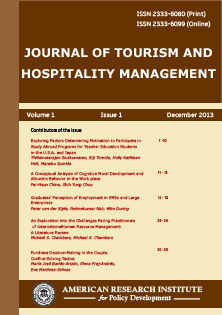 Each paper published in Journal of Tourism and Hospitality Management is assigned a DOI®number, which appears beneath the author's affiliation in the published paper. Click HERE to know what is DOI (Digital Object Identifier)? Click HERE to retrieve Digital Object Identifiers (DOIs) for journal articles, books, and chapters. Dr. Juan Ignacio Pulido-Fernández, University of Jaén, Spain. Prof. Dr. H. Ridvan Yurtseven, Canakkale Onsekiz Mart University, Turkey. Dr. Oktay EMIR, Department of Hospitality Management, Anadolu University, Turkey. Prof. Ghada Aly Hammoud, Faculty of Tourism and Hotel Management, Helwan University, Turkey. Dr. Mousa Masadeh, Petra College For Tourism and Archaeology, Al-Hussein Bin Talal University, Jordan.